I have an old Defender and I love the truck, but its been a constant headache trying to find anyone qualified to work on it. Up until now, I had been taking it to another shop in North Vancouver that is supposed to be experts with these trucks, and all Ive had is bad experiences with them. 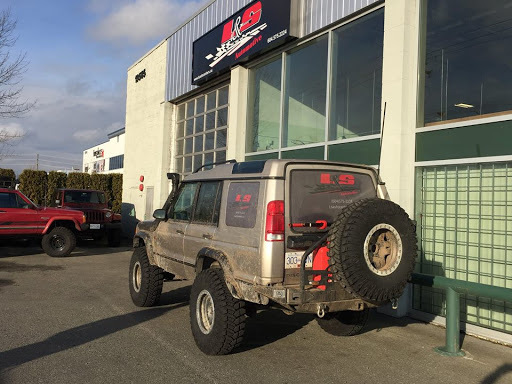 It was just by chance that I found L&S, because the owner owns a Land Rover and I just happened to see it parked out in front of his shop when I was driving by one day. Bill, the owner, used to own a hot rod shop building ultra-high end vehicles from scratch, and has a wealth of knowledge and a very competent team, including a great diesel mechanic. They took my truck in, gave me a great courtesy car, and went to work. They found the problem, fixed it properly, and got it back to me in a very timely manner and for a very decent price. Bill called me personally several times with updates, and kept me informed every step of the way. When I went to pick it up, he also had found a bunch of other issues with the truck and he went through each one with me and told me which ones would need to be addressed pretty soon, and others that would need to be addressed eventually, which I really appreciated. The truck literally drives like another vehicle. It doesnt smoke any more, and has loads of power. Bill is a rare breed. He doesnt give the typical "used car salesman" vibe you get at other shops. Hes old school and still understands the value of integrity and customer service. I highly recommend L&S and wouldnt take my truck any where else. I just left LS tire after getting a flat repaired and I could not be happier. My "low tire" light came on while grocery shopping and upon leaving the store (within 30 mins) my car was sitting on the rim. I drove across the lot to the gas station, pumped it up and headed to Kal Tire. 3hr wait? No thanks. Went to LS which was the closest other tire repair shop. They took my tire off, dunked it, found a nail, removed it and then plugged the hole, for an estimated $25. I went to the office to pay and the gentleman at the desk (unfortunately didnt get his name) wouldnt take my payment! He told me it was fine and to "just bring in $10 when youre around next." I was baffled at his kindness. Not being able to freeload of his kindness, I drove down the road to Tim Hortons, grabbed a bunch of coffees and a box of donuts and took it back. Very few times in my life have I experienced such a random act of kindness from a total stranger, so I will totally gloat about this experience and refer any of my family and friends to LS if theyre ever in need of car service. THANKS, LS!! I went to L&S for a levelling kit with new wheels and tires for my F150 and could not be happier with how it all worked out. When I got my truck back it looked amazing, No rubbing whatsoever with an aggressive stance. A great place to get the job done right and how you want it. Bill the owner is a great guy to discuss upgrades, he really has knowledge in this business and wont mess around with hidden fees or charges. What you see is what you get. The guys here are amazing. They get that people dont wanna dump tonnes of money into their cars when there are alternative options. Clearly, this team loves what they do, and they arent just looking for a quick easy buck. Thats saying alot cuz other shops arent always so forthcoming! Dont let Bills tattoos intimidate you! These guys are truly worth checking out! This is one of the best mechanic shops Ive ever used. I had to get some work done on my van and I wouldnt have transportation for a few days, and Bill the owner gave me a car to use over the weekend, no extra charge. I was very happy with the service, everyone was very friendly and accommodating. I highly recommend this shop because they are honest. I am all the way from calgary with almost teed left on my tires. They were SUPER BUSY but made sure to put a rush on my tires and had them done in less than two hours! Amazing service will definitely recommend and go again if Im ever back in the city again!!! Very informative and helpful. I normally feel intimidated as someone who doesnt have much knowledge in the area of cars but the LS team puts me at ease and I feel confident that Im receiving the best service. Thanks guys! Great experience with these guys. The manager even offered some helpful advice that saved me some cash! Always friendly and courteous. Theyre busy for a reason. His work is awesome. He made my truck look great and everything seemed very well done. I would recommend him to anyone needing there vehicles done !! They tell you to stop by only to say our guys are going to lunch break. To come back in about an hour. Ill never recommend this shop. These guys are great!! They worked with me and kept me informed every step of the way. Got me the best prices and worked quickly.